Home » Who is the 2nd Beast of Revelation 13? Who is the 2nd Beast of Revelation 13? Revelation 13: 11 Then I saw a second beast, coming out of the earth. It had two horns like a lamb, but it spoke like a dragon. 12 It exercised all the authority of the first beast on its behalf, and made the earth and its inhabitants worship the first beast, whose fatal wound had been healed.13 And it performed great signs, even causing fire to come down from heaven to the earth in full view of the people. A deceitful false Christian leader—A “Catholic” despot will soon emerge; this man will sway millions with his stunning miracles. The Bible reveals that this end-time revival of the Roman Empire will combine the power of a dominant church with the political machinery of the state—the “woman” (symbol of a religious leader) will ride the beast (symbol of the state—see Daniel 7:8, 20-21; Revelation 17: 1-6). European history makes it clear that the Catholic Church, allied with European kings down through the years, made it possible for ambitious kings to unify large areas under the banner of what could then be termed the Holy Roman Empire. Revelation 17:1-2 says the great harlot (false church) involved herself with secular politics: “Come, I will show you the judgment of the great harlot who sits on many waters, with whom the kings of the earth committed fornication…”. God describes this “unholy” alliance between church and state as an act of spiritual fornication. God hates the “harlot” with her poisonous doctrines and destructive politicking. The Apostle John, in the Book of Revelation, revealed just how influential the Catholic Church would become down through the centuries. An angel had explained to John that “the waters which you saw, where the harlot sits, are peoples, multitudes, nations, and tongues (languages)” (17:15). No other Church in history has exercised so much power! This fallen woman who “sits on seven hills” (17:9) is the great false church whose headquarters is in Rome, Italy today. For over 2000 years Rome has been known as the “city on seven hills”. The Catholic Encyclopedia states: “It is within the city of Rome, called the city of seven hills, that the entire area of Vatican State proper is now connected” (The Catholic Encyclopedia “Rome” Thomas Nelson, 1976). ● In 554 A.D. Emperor Justinian restored the Roman Empire and proclaimed himself the agent of God, the emperor of the resurrected Holy Roman Empire; he acknowledged the supremacy of the Pope. This was the first restoration of the Roman Empire in Europe. ● In the year 800 A.D. Charlemagne, a zealous Roman Catholic of Germanic heritage, was crowned by Pope Leo III as Emperor of the Romans. This was the second revival of the Holy Roman Empire. During his reign of forty-six years Charlemagne undertook fifty-two military campaigns. He brought much of western and central Europe under his power. Charlemagne’s empire encompassed today’s modern territories of Germany, France, Holland, Belgium, Switzerland, Hungary, part of Spain, and most of Italy. ● The alliance between the Papacy and Germany was to play out again and again in European history. In 962, the new emperor of the German nation, Otto the Great, revived the European Empire (the first German Reich) and was crowned Holy Roman Emperor by Pope John XII. Once again Germany became the pivot point of Europe. This Reich (Empire) became known as the Holy Roman Empire of the German Nation – the third revival. ● Charles the V’s Catholic Hapsburg Empire dominated Europe and other parts of the world, including Spanish America in the early 1500s. This was the fourth of the “seven mountains on which the woman sits The fourth of the seven revivals of the Holy Roman Empire saw the Catholic Church playing a major role. Remember, a mountain is a symbol of nations or an empire (Revelation 17:9). ● One of history’s most prominent dictators was France’s Napoleon Bonaparte, who was to lead the fifth revival of the Roman Empire in Europe. In 1804 Napoleon crowned himself emperor of France, and later that year at Notre Dame Cathedral in Paris Pope Pius II crowned Napoleon as the leader of the Holy Roman Empire of Europe. 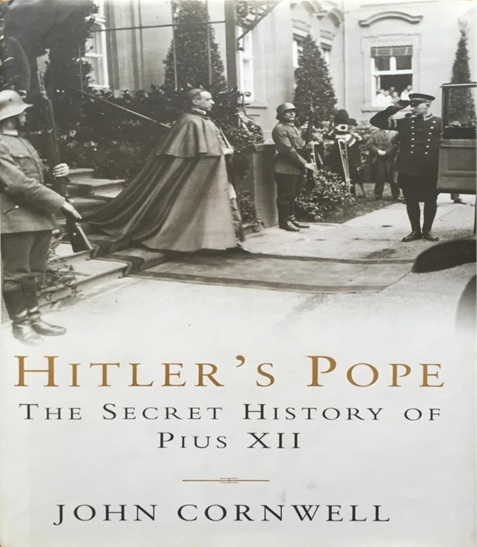 The Vatican’s Secretary of State, Cardinal Eugenio Pacelli (the future Pope Pius XII; 1939-58) and Germany’s Vice Chancellor, Franz von Papen, formally signed a concordat between the Holy See and the German Reich on July 20, 1933. Hitler interpreted the concordat to mean that he had won the church’s approval, thereby gaining international approval of his Nazi regime. So why did the Catholic Church sign the agreement? The Church feared Hitler and sought to protect itself against the Nazi party in Germany. In turn Hitler gave the Catholic Church a degree of freedom to run its schools and programs without Nazi interference. The Vatican has been highly criticized for its failure to speak out against Hitler during his reign of terror. Israel to this day is angry with Vatican officials for wanting to make Pope Pius XII a saint. This coming false prophet, will emerge to billions of human beings to be a dynamic, charismatic leader representing Jesus Christ. But his message will be that of Satan the Devil. This magnetic false church leader will perform “great signs” and even make fire come down from heaven! This coming religious leader, scriptures says, he will be worshipped by his followers. Here is the patience of the saints; here are those who keep the commandments of God and the faith of Jesus. Commandment keeping is important to God! We watch closely the Vatican, and we will be very interested to see who will be the next in line to replace Pope Francis.